Essaying’s art & craft: Dinty Moore talks structure, timing, revision. 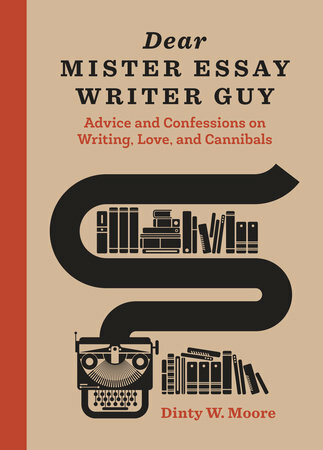 Dear Mister Essay Writer Guy: Advice and Confessions on Writing, Love, and Cannibals by Dinty W. Moore. Ten Speed Press,193 pp. 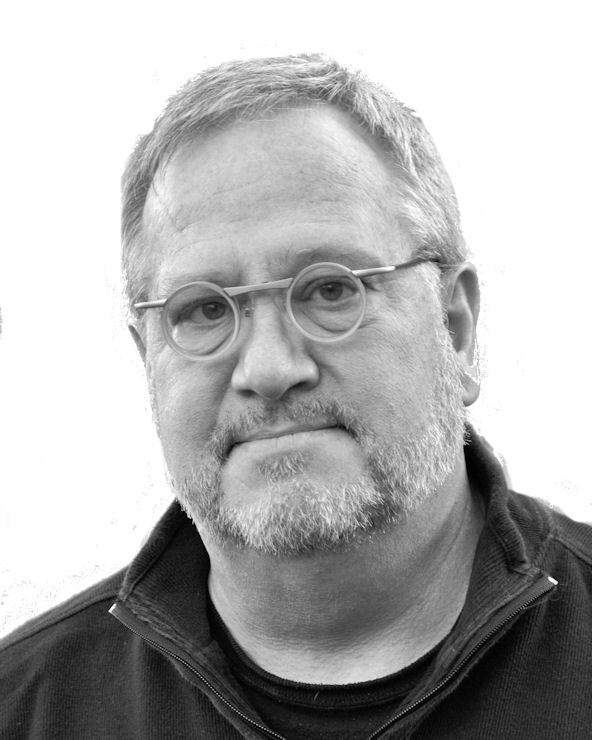 In Dear Mister Essay Writer Guy, Dinty W. Moore plays both straight man and humorist. He answers prominent creative nonfiction questioners—who pose ridiculous or book-length conundrums—and then he presents his more-or-less illustrative essay. Out of the absurd queries flow pervasive exaggeration, deft timing, addled answers, and wry storytelling. This sustained comedic performance glimmers with wisdom concerning life and the creation of art. To state the obvious: Dear Mister Essay Writer Guy employs the structure of an advice column. Many now call such a borrowed structure a “hermit crab,” a term coined by Brenda Miller and Suzanne Paola in Tell it Slant. Within Moore’s clever container, this mega hermit crab, are baby ones, such as essays presented as lists, and one on a cocktail napkin. And then there’s his playful, celebrated experiment in form, “Mr. Plimpton’s Revenge,” a Google Maps essay on his encounters as a bumbling college student charged with escorting the befuddled literary lion. A personal favorite Moore works in is “Pulling Teeth, or Twenty Reasons Why My Daughter’s Turning Twenty Can’t Come Soon Enough”; he explains in his preceding answer that it’s all he could salvage from a failed book project on adolescent girls that consumed five years of hard labor (discussed previously). In “Have You Learned Your Lesson, Amigo?” Moore appreciatively dissects the craft of two con artists who fleeced him on the street. This is reminiscent of his essay “The Comfortable Chair: Using Humor in Creative Nonfiction,” in Writing Creative Nonfiction, edited by Carolyn Forche and Philip Gerrard, which profiles an unctuous but irrepressible furniture salesman named Howie. Moore so admires professional competence that he’s amused by Howie and less than outraged by the latter pair of larcenous fellow travelers. I may not be as objective as some, because I know Dinty Moore, but I was charmed and inspired by Dear Mister Essay Writer Guy. Charmed by its lighthearted spirit and inspired by how he used his writing practice and his sensibility to craft art in prose. Once you had the idea for your approach did you feel you “had the book”? That sounds too reductive even as I ask it, but I wonder where in the process, here and elsewhere, that structure tends to appear for you? I sense it occurs initially for many writers, and then they refine it or alter it. Isn’t at least a fleeting conception of structure necessary to even begin writing something? Naturally this has implications for teaching. The moment that I “get the book,” or see clearly what the external shape and inner gears might look like, has been different for every book I’ve written. Dear Mister Essay Writer Guy fell together more quickly than most, because the idea of an advice columnist approach, with individual questions from fellow essayists, pretty much determined how each chapter would play out. Beyond that, though, I still had to search for what I hope is – in the end — a graceful overall narrative arc, and I still had to fiddle around for months to see what essays might appear in which order. A more common experience for me, both at the book level and the essay level, is to write pages and pages of material with no idea how the final shape might present itself, and then to only begin to discover my overall structure in draft six or ten. Since we’re on craft here, I’ve always loved your sentences. Like buttah! They are so fluent and perfectly punctuated. You have said you struggle with first drafts but love revision and put essays through 20, 30, or even 50 drafts. I wonder what that means—in this age of computers writers can lose track. What do you call a draft? And most of all, What is happening in your own process of revision? Thanks for the compliment. And you are correct that drafts are hard to count in the digital age. I can’t claim to have a perfectly accurate way of keeping track, but, for instance, when knocking out what might eventually become a twelve page essay, I will start with three or four pages, comb over those ten or fifteen times as I add another page, and another, and another, and when I’m starting to believe in the solidity of those earlier pages, I comb over the newer pages ten or fifteen times. And by combing over, I don’t mean correcting spelling and grammar, but rather pushing around sentences, drafting new sentences, adding and removing chunks of material, reordering thoughts. When I’ve reached the end of the essay, or what I imagine is in fact the proper end, I will start back at the beginning and go through from front to back, usually reading aloud to myself every page, still tightening, adding, subtracting, and reordering. That may constitute another ten or fifteen drafts, spread out over weeks. And then there are the final three or four drafts, where I am questioning each and every sentence for both musicality and meaning. Sometimes a sentence sounds good but in the end says little. Sometimes a sentence is important but refuses to sound good. I’ll chase those little devils to the end of the Earth. You founded and edit Brevity, devoted to concise or flash essays of 750 words or fewer. Although you have admitted being challenged by this level of brevity yourself, your essays and books are nonetheless distinguished by a graceful less-is-more approach. To me, this has many virtues, including letting the fullness of implication bloom. What advice can you give those of us who have the tendency always to go long? Going long is natural in early drafts. It takes sometimes sixteen sentences before you hit on the best way to say something. Allow yourself that freedom, but when you arrive at the right wording, the best image, the precise diction, go back and erase those fifteen sentences that led you there. I laughed out loud reading Dear Mister Essay Writer Guy. Of course humor runs through your work—The Accidental Buddhist is funny too, as well as poignant and informative as you undertake a spiritual quest as our hapless stand-in and fellow baggage-carrying adult. Is humor a default setting for you, or do you sometimes start out very soberly and then see the humor? Although you seem to have a gift for humor, how have you honed it? Are there humorous writers you return to, enjoy, and learn from? 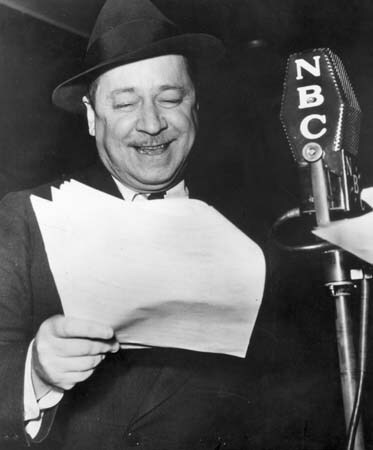 Oddly, my boyhood writing hero was the humorist Robert Benchley, a member of the Algonquin round table (along with Harpo Marx, Dorothy Parker, and Alexander Woollcott) back in the 1920s. I say “oddly” because not many people were still reading Benchley in the 1960s and 1970s, but I stumbled into his work at my public library and fell immediately in love with his whimsical riffs and curious formality. So I think he influences me still, as does Kurt Vonnegut. Comedy is all about timing, and anticipation, so I spend a lot of time reading my drafts out loud and trying to “hear” how the humor plays, and I think deliberately about what one sentence might lead a reader to expect and how to perhaps up-end that expectation. The truth is, I hate my voice on the page when I’m not being funny, or at least slightly wry. To my own ear, I sound sanctimonious, insincere, and whiney. Thus, a joke, always a joke. It drives my wife crazy. Finally, and we may need to hear from Mister Essay Writer Guy here—because he seems smarter than you and certainly than me. What the heck is a lyric essay? To what extent are poet-voice and tambourines involved? Inquiring minds want to know. And don’t spare the horses, Guy. A lyric essay is any essay written in French by a poet. This is different from the loric essay, which is an essay scratched in the dirt by a slow loris. The latter, you might imagine, take a long time to complete. And since lorises are nocturnal, meaning they are scratching out their essays in the total darkness of the Sri Lankan forest, the loric essay can be very hard to read. (My evidence: there are only two loric essays listed as “Notable” in this year’s Best American Essays.) Did you know, by the way, that female lorises bathe their young with allergenic saliva, a form of spit that is mildly toxic and discourages predators? This is true, and it is also a metaphor for the lyric essay, which, as Montaigne famously said, “can make one’s head spin so vigorously that one loses one’s stomach.” As for tambourines, Bob Dylan’s “Mr. Tambourine Man” is a classic example of the lyric essay, because it uses the words “jingle jangle morning” and “magic swirlin’ ship.” Most lyric essays use these words, so in that way, they are easy to identify. Thank you for this fascinating post, Richard. It is both comforting and daunting to find out how much elbow grease goes into great writing. Well said—my feelings exactly, John. Hi, Richard. By an odd coincidence, I come to this post with a recent discovery of a certain writer, both fiction (supposedly) and essay, Elizabeth Hardwick. I wonder, have you ever read her? More specifically, have you ever read her novel “Sleepless Nights”? That’s what I read, and I really don’t know whether to call it a novel masquerading as a memoir or a memoir masquerading as a novel. She says at one point (a comment which occurs in the context of the “novel” itself of course, complicating the issue) that her mother criticized her for putting both fiction and fact in the same book. And in many places in the book, she has little snippets of letters to a mysterious “M” which are signed “Elizabeth.” Then, she also includes a letter or two to her mother. She also follows the trajectory of her own travels and career in giving the “character” Elizabeth a geographical history and adventures. When you read her short biography appended to the book, it turns out that she is an award-winning essayist as well. But though there’s no surprise there, it doesn’t solve the problem of that particular book. I’d be glad of your opinion if you know of it. She too has a sort of wry manner, but she spends a lot of time analyzing people and their habits and conditions with a sort of seriousness that seems to preclude any really zany humor. Maybe you can identify just what she’s doing? That sounds like a fascinating novel, Victoria. The only thing I have read by Elizabeth Hardwick is her short biography of Herman Melville. It is superb. She was quite the all-around writer, reviewer, and woman of letters. I haven’t read Dinty’s book yet but am looking forward to it! Thanks for posting the interview. I go through MANY drafts over MANY months as well, and it’s comforting to know other writers do, too. Regarding the question by shadowoperator, I haven’t read Elizabeth Hardwick, but I assume she was writing autobiographical fiction in the book mentioned, or “auto fiction.” Many writers use personal experiences, but if they make part of it up and/or want to give the work a fictional feel and/or want to add a layer of remove between the page and themselves, they call it fiction. Think Karl Ove Knausgard for an epic scale example and Lydia Davis for a micro. There are many others, of course. Auto fiction is popular now, or maybe it’s just that because of the internet and access to interviews and reviews, we’re more aware of it. Thanks for the perspective, lorrimac. I had not heard of the term auto fiction! Thanks, Lorrimac. I have often run across novels in which fictionalized autobiography appears, but the authors have always ducked behind the “this is only fiction” rhetoric, and it’s been mainly knowledge of their biographies which I’ve acquired separately that has informed me about the non-fictional element. Elizabeth Hardwick seems not to play her cards so close to the chest as these other novelists I’ve read. I haven’t read the other two authors you name, but am very interested to hear of the “auto fiction” trend. I didn’t know about Moore or Hermit Crabs. Thanks for keeping me current and giving me yet another book I want to read. Thank you for commenting, dclaud.